When Residents of Ontario, CA need to sell their coins, they come to Markham Numismatics. We are the largest coin dealer in the Chino Hills area. and have more than 30 years of experience in appraising coins and buying gold coins and coin collections. If you have coins to sell, come to where the dealers SELL! 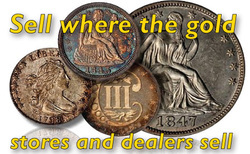 We are nationally recognized rare coin experts and BBB Accredited coin appraiser. We have unsurpassed knowledge of coin grading and coin values, which makes us the SMART place to SELL your coin collections, gold coins old currency. At Markham Numismatics you can make an appointment to come into our safe and secure office with your coin collection, or if you have a large collection, we can arrange an in-home appointment to purchase your coin collection. When you have coins or don’t trust mailing them to an out of town gold buying “store” who will have some faceless person with no qualifications tell you what your valuables are worth. Also steer clear of store that buy baseball cards, watches ,jewelry and oh ya coins! these store tend to possess only general knowledge of coins..
Markham Numismatics has been in business for over 30 years . we have purchased gold coins and rare coin collections from thousands of satisfied customers. Find out what they already know, that Markham Numismatics provides the best place for your unwanted coins, coin collections, silver eagles and proof sets. Markham Numismatics is the most respected coin dealer in the Norco area for a reason. We are trusted experts who can appraise your coin collection. Call and schedule an appointment today!